Here in Michigan, fall is upon us. I actually found the first red leaf on the ground yesterday in my backyard, so the seasons are definitely changing. Before you know it, Christmas will be here, so it’s time to get our health and finances back on track before then. There’s truly nothing worse than going into the holidays financially unprepared and regretting your holiday spending. So, I actually plan all year long for the holidays. I start thinking about Christmas and saving for Christmas presents very early in the year. I buy my kids presents when I see them on sale and try to stick to the four gift rule for Christmas presents. Unfortunately, the holidays sneak up on many families, who in turn put their Christmas shopping and holiday expenses on a credit card. This makes many parents feel uneasy, especially after the sparkle of Christmas morning leaves and credit card bills remain. So, I’m writing this post today to encourage you and to let you know there is still time to get your finances back on track before the holidays. There’s still time to save for Christmas gifts. There’s even still time to finish the year on a strong, healthy note! Many people have made the connection between getting physically fit and financially fit. They really do go hand in hand! So, while you’re getting your finances in tip top shape, why not focus on your health too? Remember, you don’t have to wait until the new year to start tackling your health and your fitness goals. One of the best ways to get your finances back on track is to literally track everything you spend. You can do this through a free app like Personal Capital or with pen and paper. The point of tracking your spending is to know your weaknesses. If you find that you spend a lot of money on groceries, you know that’s something upon which you can improve. Interestingly enough, tracking what you eat and when you work out is one of the best ways to improve your health. Writing down what you eat makes it easier to stay focused. If you know you have to write down that you ate ice cream or cookies, it will make you less likely to eat it. Similarly, if you have to write down that you spent $50 on a manicure, you’re more aware of the purchase. Tracking everything is really just the first step to financial and physical wellness. You won’t know where you can improve or what you should budget until you know what you spend. When it comes to health and savings, creating goals is extremely important. It’s not enough to say you want to save more or lose weight. Your goals need to be S.M.A.R.T., that is specific, measurable, achievable, results-focused and time-bound. Try to save a certain amount of money in 60 days or pay down a specific amount of debt in three months. Similarly, try to lose 10 pounds by Christmas or go to the gym three times per week every week until Christmas Day. Goals like these will help you stay focused; because they are specific and achievable, you’ll get a surge of confidence every time you meet them. It’s hard to remain disciplined when it comes to health and finance. I know this from experience. So, don’t deprive yourself when you’re trying to get your finances back on track. Allow yourself a food “cheat day” once a week where you get to enjoy your favorite chocolate bar. Similarly, allow yourself to go out to a movie once you’ve reached a specific debt repayment or savings goal. Goals are hard to reach and big lifestyle changes are hard to maintain when you don’t have something to look forward to. So, reward yourself and do it often to keep yourself motivated. At the end of the day, getting your health and your finances back on track is about the bigger picture. It’s not about being thin or about having tons of money. It’s about living a full and healthy life. It’s about having independence. It’s about looking and feeling your best, which is only possible when you’re healthy and not stressed about your finances. So, when things get tough or if you’re unmotivated to get healthy before the holidays, remember why you want to do this to begin with. You don’t have to do it for anyone else except yourself, and you’ll be so glad you did. Have you reached any big health or financial goals lately? What do you do to stay motivated to reach goals before the holidays? How do you motivate yourself when tempted to give up on a goal? 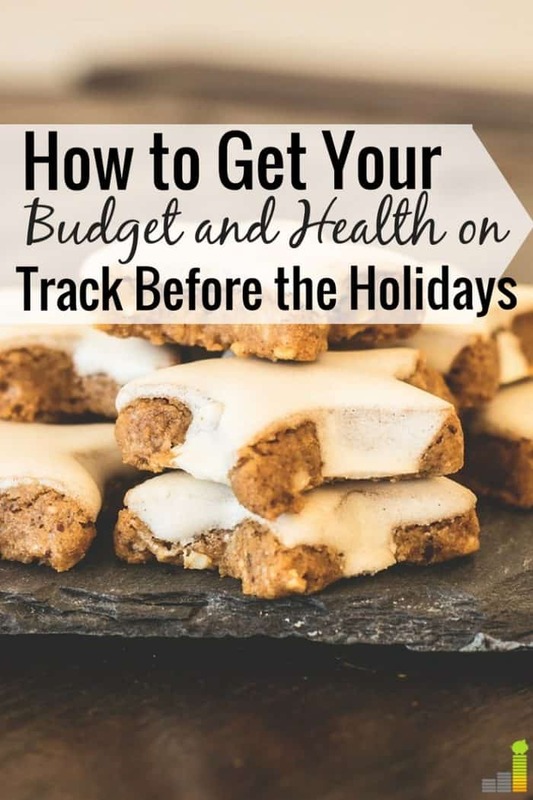 The post 4 Ways to Get Your Health and Finances Back on Track Before the Holidays appeared first on Frugal Rules.